You are currently browsing the tag archive for the ‘Trompe l’oeil’ tag. Earlier this year I found my name mentioned on the Coventry University website. Film footage of Lanchester Polytechnic had been found in the Media Archive for Central England (MACE) and a request was made asking for anyone who had knowledge of the films to get in touch. The first film was a television news piece from 1965 which shows a group of students lifting a Mini car in an attempt to set a record. 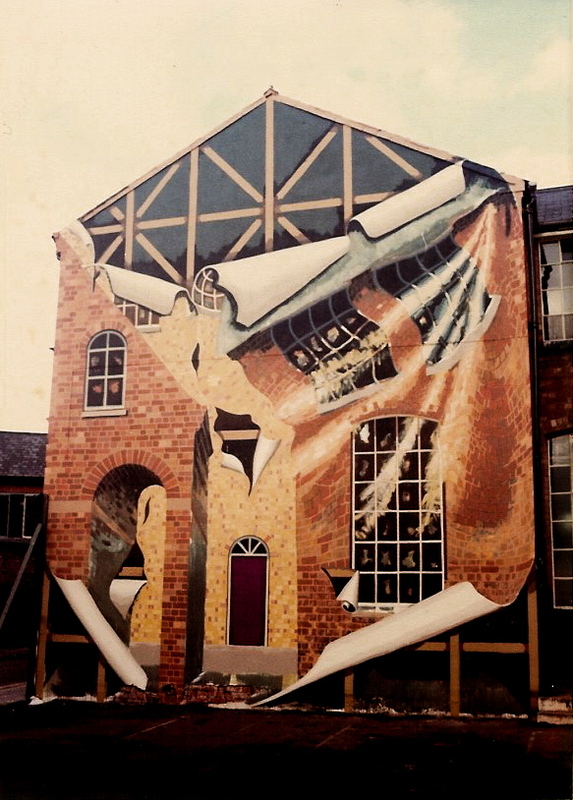 The second, footage of a mural which ‘was decorated by student Colin Slater as part of his degree course’. The statement continued, ‘If you are one of the students who helped to carry the car in the video or if you remember this event, please get in touch! 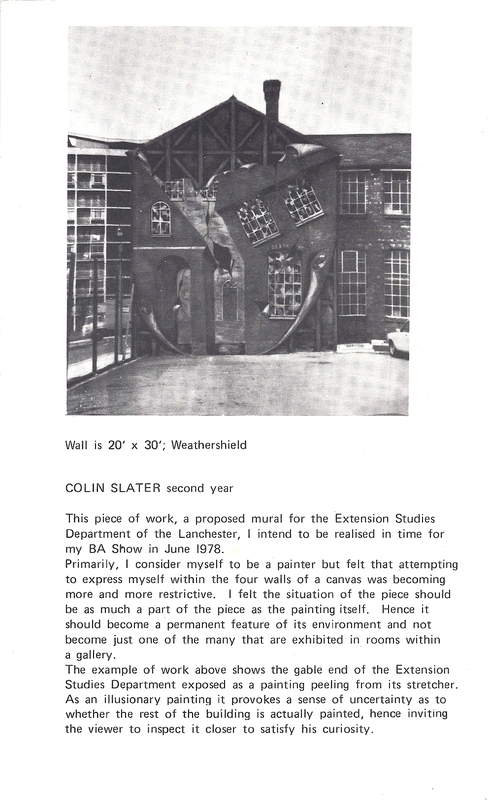 We would especially like to hear from Colin Slater or anyone who remembers the mural on the side of the building. Our email address is alumni@coventry.ac.uk’. I answered the request and over the following weeks an email conversation took place resulting in an article about the painting being featured in Evolve, the magazine for Friends of Coventry University. I would like to express my thanks to Madeline Cheah & Kristina Anders of FOCUS for making contact with me and for putting the article together. The painting was only projected to have a life span of 3 months but actually existed for 11 years. The article published in Evolve has given it a new lease of life and now, thanks to film footage found in the archives of MACE, it can live on indefinitely. This is a transcript of the full interview. Although I still considered myself a painter, in the Spring of ’76 my work was stale and I was frustrated with my lack of progress. I needed to stimulate a change of thought and working pattern. I selected the ‘Psychology & Art’ programme as my Art & Design History preference, and attended a series of seminars each week presented by Alan Dyer and moved my practical work for a term to the Printmaking department. Here I explored new practises and processes, and was encouraged to explore the space beyond the metal plate by cutting it up and reshaping the image so that the print wasn’t limited to the confines of a square or rectangle. However as the paper on which it was printed was still pre-determined my frustrations continued. I was keen to break free from a traditional and conventional format and it was my Art History seminars with Alan Dyer which began to suggest some very interesting possibilities. I remember sessions illustrating the functions of the eye and brain, the psychology of perception and the art of illusion. That spring term really captured my imagination and I began to find a new direction. In the library I investigated the work of Escher, Magritte, Dali and of many others who employed illusion as a device, but more important was a style of painting which I previously hadn’t thought of as being relevant to me, however now I began to notice it in a different light. It was known as ‘Trompe l’oeil’. I became increasingly interested in the idea of art being relevant to a particular place as much as the effect it could have on that place. I was also interested in the idea of a painting that was fixed and immovable, which led me to view with ‘fresh eyes’ the paintings of the Renaissance, of Palaces and Country Houses, and which, in turn, led me to the Mexican Murals of Siqueiros, Rivera and Orozco. I decided I would make a contribution to this great tradition and my Final Degree Show comprised of a number of large scale paintings, both as realised projects and as proposals. It was thanks to my personal tutor, Tash Shenstone, that my ambition was realised. He gave me terrific support for 3 years and always showed great belief in me. If it wasn’t for him, the painting wouldn’t have happened. 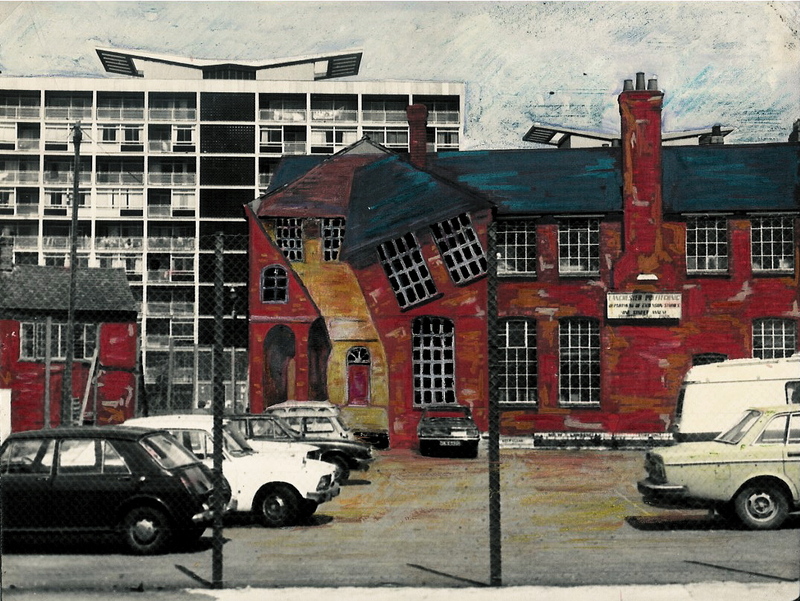 After speaking with him about my desire to paint on a large scale and for it to become a permanent feature, it was he who found and suggested the site – the Extension Studies building located in Vine Street – and I developed the design specifically for that building, for its cement rendered gable end. 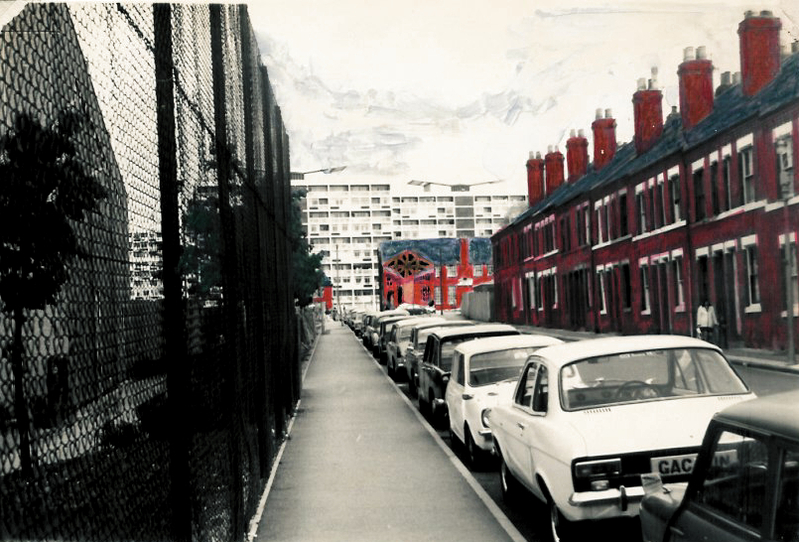 In the late Seventies, in both the USA and Great Britain, large exposed walls were being painted in urban areas to establish an identity in harsh economic times and many murals at that time were loud, garish and unsympathetic with the local environment. My intention was to produce an image that worked with its surroundings but which could catch ones attention through a subtle twist or tease of the eye. On the one hand it could be passed by unnoticed, on the other it might be interesting enough to be observed more closely. 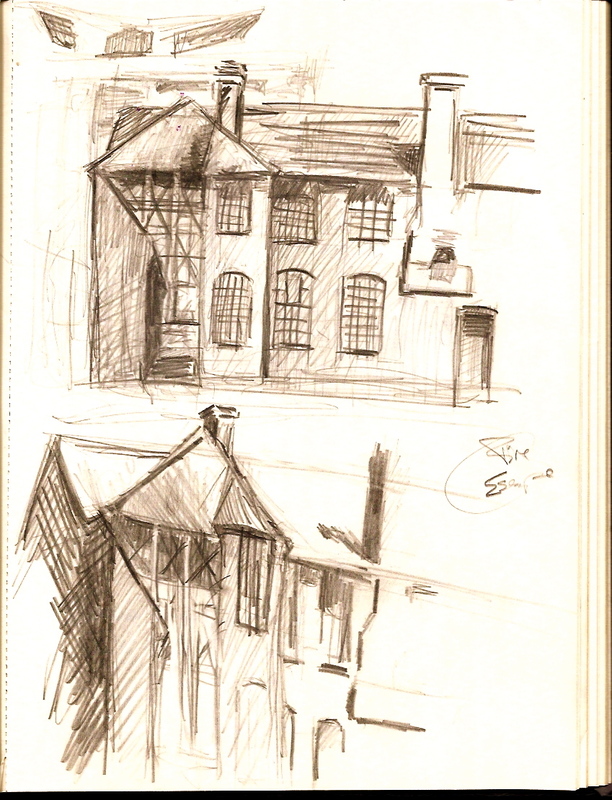 Many ideas were scribbled in my notebooks and upon photographs taken of the building. 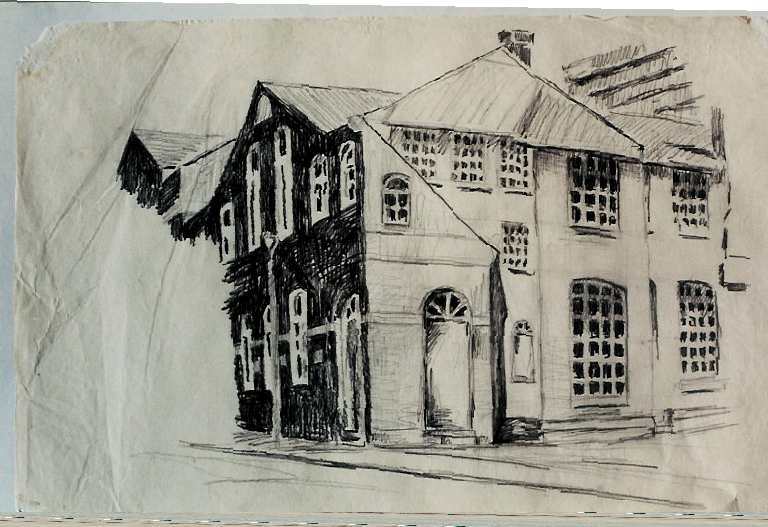 My initial drawings employed the architecture of the building, and as my ideas developed they became more influenced by the surreal paintings of Rene Magritte and the metaphysical cityscapes of Georgio de Chirico, however it took some time until I was satisfied with the image. The drawing didn’t work, it looked too much like a theatrical backdrop. What was the point of painting something ordinary on such a large scale, and on an exterior wall? I had to rework the image. Something was missing. I have been a supporter of Wolverhampton Wanderers Football Club for many years, and while at the Lanch Saturdays were often spent driving to football grounds within striking distance of Coventry to watch them play. 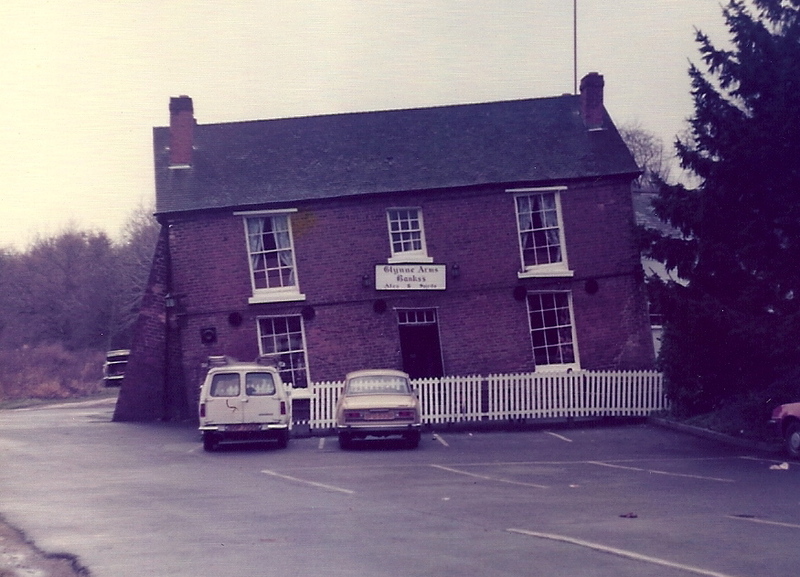 One weekend in 1976, whilst on my way to Molineux, I came across a pub located in Himley, the Glynne Arms, affectionately referred to as ‘The Crooked House’. A signpost directed me along a narrow lane, at the end of which, sitting shrouded in mist, was the strangest sight I’d ever seen in my life. A building stood at the most precarious angle defying gravity, the door and windows following the same tilt. Fortunately I had my camera with me and I took a photograph before entering. The interior was even more peculiar. A working Grandfather clock leaned back against a wall, a chandelier hung from the ceiling at 60° and when touched returned to the same angle. I walked up a slope to the bar, which leaned out to meet me, and after ordering a beer the barman showed me a ball bearing that rolled uphill. He told me that it was the only pub that people entered feeling drunk, and left feeling sober. He was right! Even though I went to the match, I can’t remember how my Wolves fared that afternoon, but it was a very memorable lunchtime and I’d found an important clue which would make my painting ‘special’. 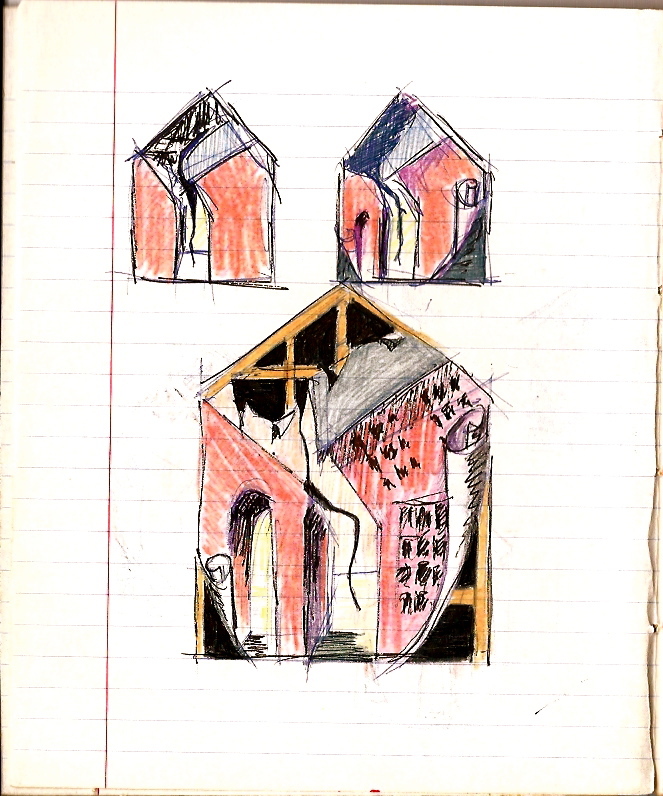 The following week I reworked my drawings again to incorporate a Crooked House, and to save time redrawing the image I repeatedly placed one sheet on top of another to trace elements of the previous version. I was using paper from a Layout Pad at this stage, and there were soon so many sheets of paper being flicked through and rolled back in order to see earlier variations that some paper layers became torn and shredded. Then, one morning, I arrived at my work bay in the studio and found the most recent drawing on my board peeling back at the corners, revealing the one underneath. I sat looking at the board while I smoked my first cigarette of the day. The best idea for the mural was staring me in the face and it would be a combination of everything I’d considered. I began my last drawings. 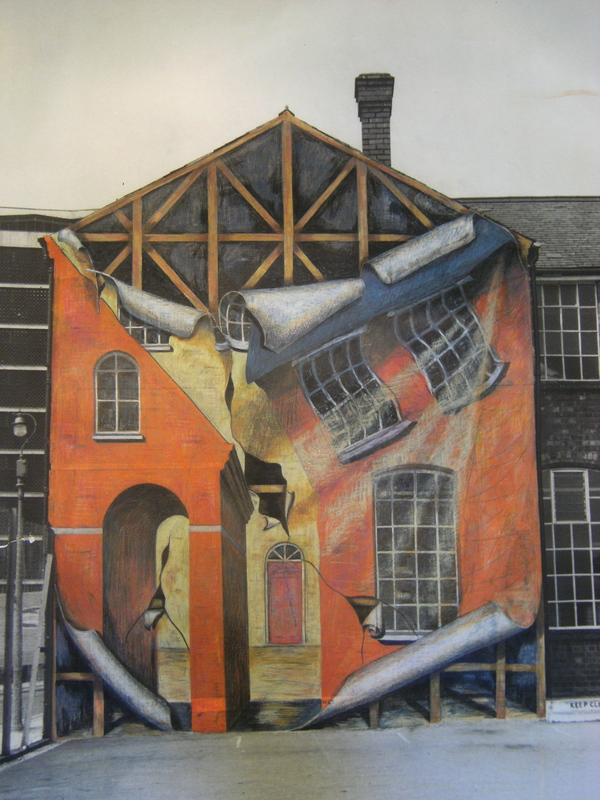 I exposed the gable end to reveal it was supported by a wooden structure, which in turn would act as a stretcher for a painting that was rolling back or peeling away. I received some criticism about my design at the time but the mural was never intended to be a painting about decay, it was more about peeling back layers. 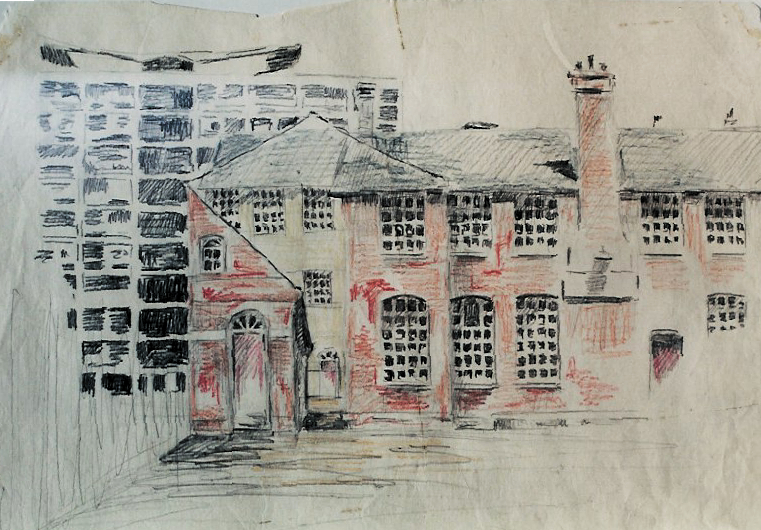 During the Spring of ’76 I began working on ideas for the painting after the site had been identified by Tash and I had produced my final drawing toward the end of the summer term. 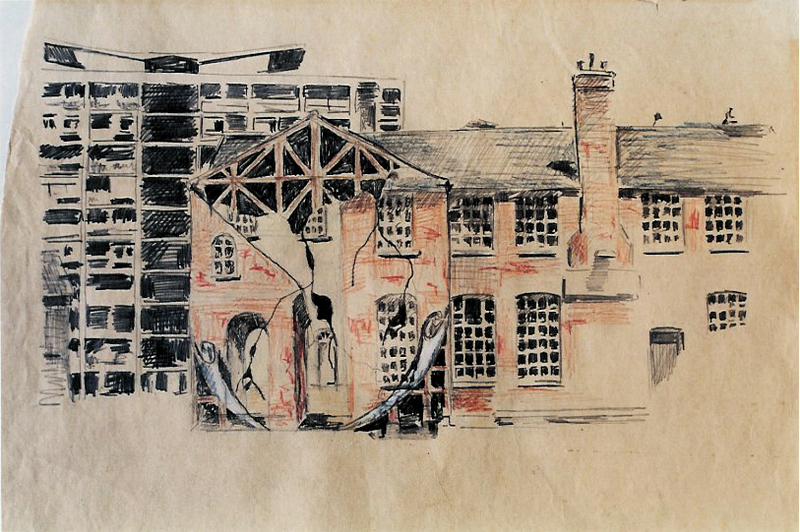 An early drawing for the proposed mural was included in the 1976 Art School Prospectus. Tash began organising meetings for me to attend from Easter ’76 in order to obtain the permission necessary to start painting. I met with representatives and officers of the Lanch as well as various departments of Coventry City Council. Following a meeting with the Department of Architecture and Planning in Jan 1977, which I thought would be my last, I received a letter from Harry Noble, the City Architect and Planning Officer. Instead of a green light the letter stipulated that I had one more hurdle, I still required formal permission from the Education Committee who were owners of the building. The Joint Education Committee discussed this at their meeting on 21st April and on 11th May I finally received a letter of authorisation. As I attended one meeting after another, as well as having countless telephone conversations, I thought this process would never end and it was this stage of the project which inspired the title of the painting, ‘Patience is a Virtue’. Obtaining the necessary permission had taken a whole year. I had hoped to have completed the painting before the end of my second year, to have painted it during the summer term to take advantage of the better weather and longer days, but there wasn’t enough time remaining of the Art School year to organise materials etc. before the summer break. Nevertheless, on my return in October, during the second week of the Autumn term, I began work on the wall itself. My diary from 1977 states that I began erecting scaffolding on Thursday 13th October, with the assistance of my close friend John Jostins. John is now Professor of Sustainable Transport Design at Coventry University and founder of Microcab. He has been a lifelong friend. We were at school together and at Loughborough College of Art & Design before attending the Lanch, and I often assisted him with his environmental sculpture projects. As a return favour, he worked with me for the first week. We constructed the scaffolding in front of the wall, prepared the surface, painted the wall with a coat of pri mer and then began transferring my drawing to the wall. After that, I was on my own. A couple of chums visited and painted with me for an hour or two, but other than John’s help at the beginning, the next couple of months was just me and the wall. My last day of painting was Thursday 15th December and the following day, the last day of the Autumn term, John returned and helped me take down the scaffolding. 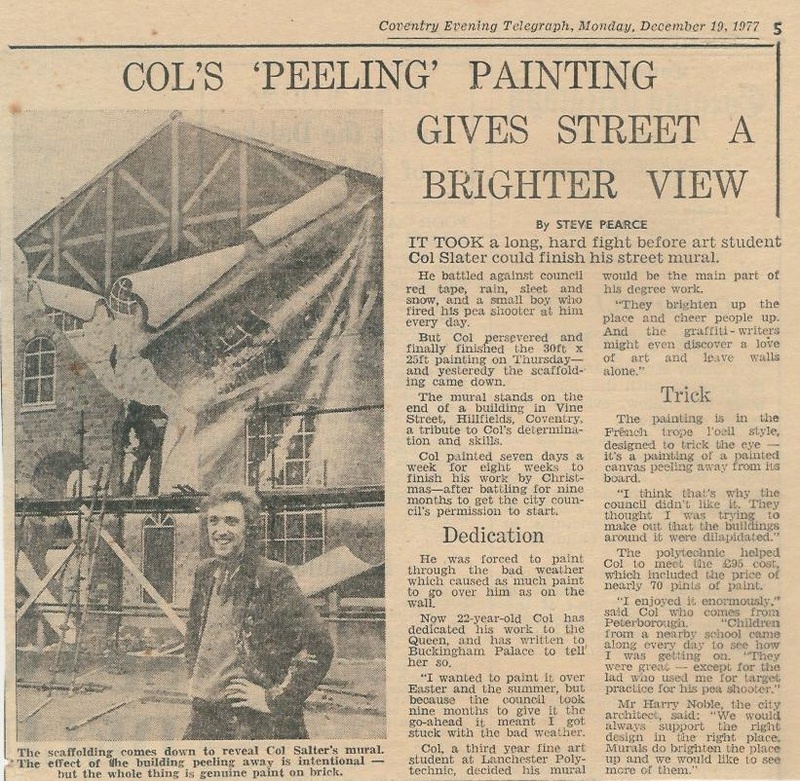 A photograph of us engaged in this task, with an accompanying article about the painting, appeared in the Coventry Evening Telegraph the following Monday. So, how long did it take? The painting itself took 9 weeks, but the postcard I produced to promote the project reads ‘Easter 1976 – Autumn 1977’……….which is 20 months! Not an easy one to answer. Gaining the necessary permission was tough. As word spread that we were trying to obtain permission to paint, it seemed that an increasing number of departments became involved. Once one hurdle was out of the way, another appeared in its place. It was a process I had never encountered before and I had my hopes built up and dashed several times. It was tempting to give up at that stage and I asked myself many times whether it was worth it, it would have been easier to work in the studio and continue painting on an easel. However Tash was pivotal to the success of the project at this stage. After establishing the site he then helped me pass all the obstacles and kept my spirits up as more red tape manifested itself. It was thanks to Tash that the project succeeded. As for painting, I had never worked on such a scale before. The wall was approx. 30′ high and 25′ wide and I painted in wind, rain, hail and snow. There were some freezing temperatures too and after a couple of weeks the hours of daylight became shorter so I worked continuously each day. After 5 weeks of painting I became ill, and experienced dizzy spells while on the scaffolding. I was diagnosed as ‘physically exhausted’ and advised to rest, however I was determined to finish the painting first. Instead I ate larger breakfasts and worked shorter hours. I couldn’t predict how long the painting would take and as one week drifted into the next and the conditions became colder, I experienced some difficult days. At times I felt very alone and that it would never be finished. It’s not easy to explain what keeps us going when the going gets tough. It could be fear of failure but I was determined to see it through. Perhaps, as he’d shown such faith in me, it was also because I didn’t want to let Tash down either. Whatever the motivation, I stuck to the task and it was a very proud moment when the scaffolding came down to reveal the painting for the first time. Yes, that was a great feeling! Did you enjoy it? Would you change anything in retrospect? The same could be said of the mural as the occasion when I ran the London Marathon. It was great, and looking back I can say with honesty that I enjoyed doing it, and yet pain, perseverance, endurance, commitment and determination were a large and integral part too. I have always loved painting even though there are times when it drives me mad with frustration. Painting for me has never been a leisure activity. I enjoyed painting the mural but it was also the first time I encountered what a marathon runner coincidentally describes as ‘The Wall’. Perhaps mural painting is where this term derives from! For the first time in my life I had to employ a doggedness and tenacity to see the project through to a successful conclusion. I had never had to dig that deep before. I wouldn’t change anything. As I described previously, I didn’t produce a design and then look for a wall to place it on. From the very beginning it was something I considered specifically for that location. What was the building used for? The building was part of the Polytechnic. 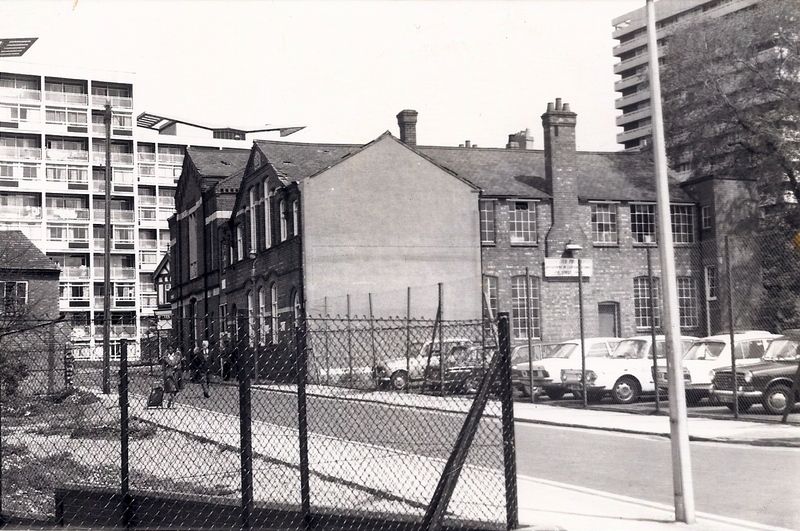 It housed the Department for Extension Studies, Vine Street Annexe. Would you mind if we featured a small snippet somewhere in e-news, our website or on Facebook perhaps? Great! I’d love you to feature it. Learning recently that it was included in the Media Archive for Central England was a revelation! I was totally unaware any moving film of it existed, and I was still at the Lanch on the date the recording was made. It gives a better sense of scale and even though it lasts only 25 seconds, the painting was brought back to life again. When the opportunity arises I still love painting on a large scale, last month I painted a mural at a Primary School in Peterborough, Cambs. Five years ago I was invited to design and lead a community mural project for an underpass beneath the A605 at Warmington, Northants, which was the largest wall I’d painted since my Coventry painting. These projects don’t occur very often, the paintings I usually produce are much smaller, although I do work on a large canvas from time to time. My subject is my love of being outdoors and walking the landscape. A selection of paintings can be found on my website – www.colinslater-artist.co.uk. I have to admit that when I left the Lanch I felt thoroughly demoralised. I was very disappointed by the grade received for my degree, which was a 2:2. I didn’t attend the Graduation ceremony the following autumn and my certificate was posted to my parents. Perhaps my mother has it, I don’t have it in my possession even now. Unfortunately my final assessment went badly, I was heavily criticised for my display and for producing only a small number of paintings. However, only two members of that panel had visited the Vine Street mural, none had seen the other I’d painted. My show was in the Herbert Art Gallery. It comprised of one painting 8’x16′, photographic evidence of other work – two murals (30’x25′ & 10’x10′) and two other paintings (8’x12′ & 4’x6′) – and drawings of proposals for other mural projects. If the computer technology we have now had existed then, my show would have had a more sophisticated appearance. If only Adobe Photoshop had been available in 1978! It took a long time for me to accept that the grade I received didn’t matter, it still allowed me onto the post graduate diploma course I’d applied for. Eventually I realised that the most important element of my course wasn’t the qualification, it was the experience of being there. It was an adventure, and the Lanch laid a foundation for possibilities which might lay ahead. In addition, bonds and friendships were established and remain strong 30+ years later. My advice to a ‘budding artist’ would be, to be a good listener. It would be a mistake to be blinkered and not listen to another point of view, but it’s also important not to lose faith with what you’re doing either. Always keep an open mind and an open ear with respect to opinion and advice, whether it is voiced by a tutor or a colleague. I often change medium to keep myself on my toes, so I drift between drawing and painting on a fairly regular basis but I don’t have any real preference. I regard drawing as an important activity so I frequently use charcoal and chalk pastel. As for painting, I work with acrylic but I really mostly work with oil. I love its versatility and the smell is wonderful! Recently I’ve been using the Brushes app. on the iPad too. What do you do to relax when you’re not painting? I’ve always enjoyed film, so an evening with a dvd or a visit to the cinema to watch a movie on the big screen is a particular interest. Listening to music, supporting WWFC, playing and watching cricket, reading, working in the garden, walking and looking out at a distant horizon, whether it’s land or sea – they’re all good! 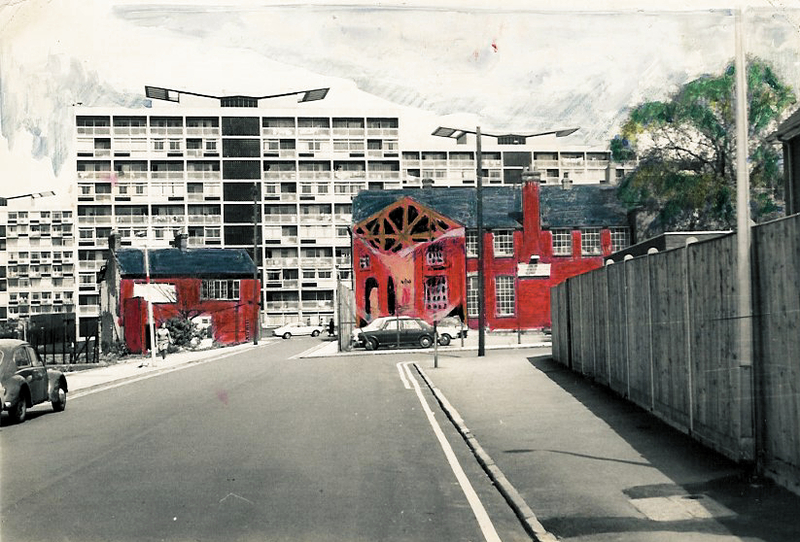 What are your favourite memories of your time in Coventry? 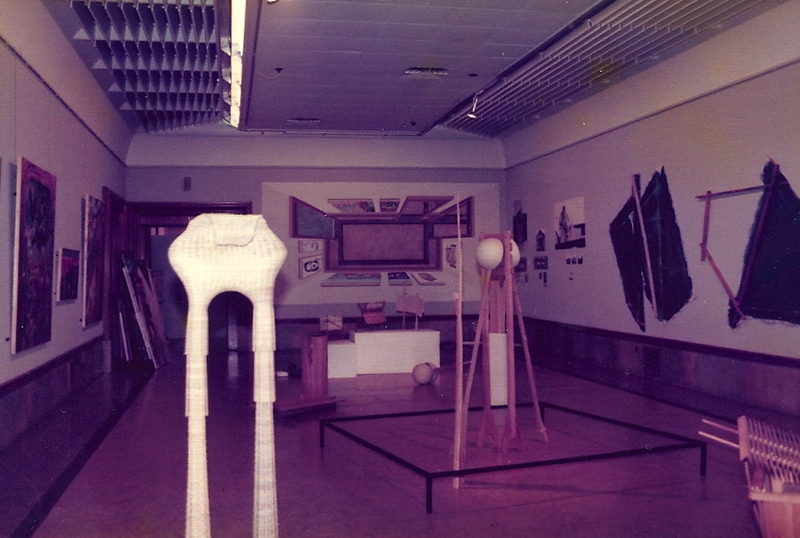 I have many vivid memories of those years, I could make a very long list, the Art Fac. was an exciting place to be. Perhaps the most special memories though are the friendships made during those years. There were many great characters and sadly some good friends I remember with fondness have already passed away. The Art Fac. Christmas ‘Do’ at The Mercer’s Arms when John and I performed a Laurel & Hardy dance routine (we performed a Fred Astaire number at another) were special occasions; a Zulu Evening we organised was unforgettable; being a member of Winsor & the Newtons, a group formed by Nick Ward; evenings at The Oak; playing for the Art Fac. football team; supporting Jerry by attending intimate pub gigs of The Automatics before they became the Specials; Ian Lorimer’s after-pub ‘soirées’; watching Davy Porrit dancing and chat up 3 girls at the same time; sharing digs with Nicola & Annie – they’re personal memories really. Good times, and the more I think about them, the more I recall. Sadly Tash passed away a few years after I left the Lanch, I have very warm memories of him and the support he gave me was beyond measure. I have wonderful memories too of my painting tutor Harry Weinberger. I respected him as a tutor and he became a good friend. We maintained a correspondence and I visited him many times at his home in Leamington Spa until his death in 2009. Last but not least however is the memory of 1977, which was a very significant landmark in my life. In May of that year I received permission to paint the mural and the following month, thanks to BUNAC, I flew to the USA where I spent the summer selling ice cream in Kansas City before travelling across the country delivering cars through their Auto Driveaway scheme. I returned from the USA on Sunday 2nd October and the next day began the final year of my BA Hons course in Fine Art by organising the materials and equipment to make ‘Patience Is A Virtue’ become a reality. While in the USA I corresponded with a student on the Graphic Design course who I had met just before the end of the summer term, and soon after I began painting the mural I asked her out on a date. Her name was Denise Thomas. We married the following year and last Christmas we celebrated our 33rd wedding anniversary. Yes, 1977 was a very big year and my relationship with my wife began with this painting. Some momentous decisions which shaped the rest of my life were made while I was at the Lanch!